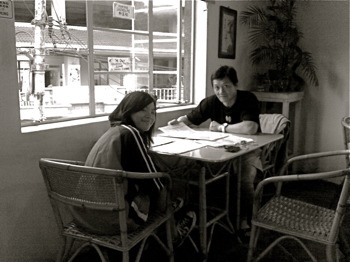 We sent Angie off to Cameron Highlands for the 5-week Residential Bible School and decided that we should take 2 nights off to relax. It was a great 3 days, walking in the mornings not only fulfilled Andrea’s PE class requirements but also did us a lot of good, much better than walking in KL! Wi-fi services widely available meant Andrea’s classes were not disrupted. I must say that I’m not good at this “self-portrait” kind of thing! 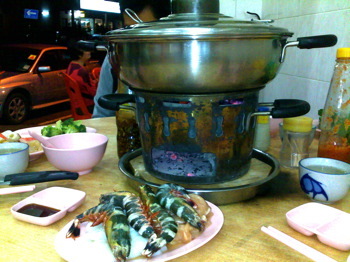 Steam boat is a MUST for us whenever we go up to Camerons. The hot food and soup plus the cool weather – GORGEOUS! We decided to try the organic steamboat. I’m not sure if we went to the wrong place but I just felt a bit let down. The soup was pretty watered down and bland. 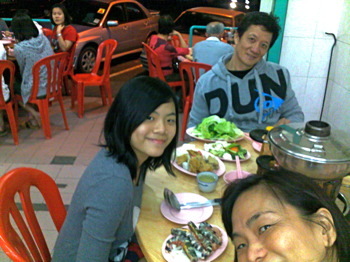 There are a few organic steamboat places in Brinchang, I don’t think there are any in Tanah Rata. Maybe next time, we should just throw our health out of the window and go for the “normal” steamboat with the really tasty herbal soup or better still, tom yam soup! !